In the years following the sub-prime mortgage crisis of 2008, millions of Americans underwent a short sale. Occurring when the borrower owes more on their mortgage than the current market value of the property, a short sale can only happen if the bank agrees in writing to take a loss. Individuals and their families who have undergone this ordeal in the past and have navigated themselves to greater financial stability may be in the position to purchase a new home. After going through a short sale, certain limitations are in place and requirements that must be met before a borrower can use a subsequent FHA loan to purchase a home. In spite of these guidelines, it is critical for potential applicants to keep in mind that it is easier to obtain an FHA loan following a financial hardship such as a short sale than it is to secure conventional financing under the same circumstance. The FHA loan program does not have a cap on the number of times a borrower can obtain financing through the program. Following a short sale, a buyer generally has to wait a minimum of 36 months before being able to secure another FHA backed loan. To secure another loan, the borrower must have maintained a good credit standing following the financial hardship. 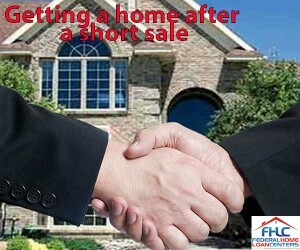 A short sale is reported as settled but not paid in full, meaning it will negatively impact your score. The FHA insures loans for those with scores as low as 580, or in some cases 500, but some lenders will not work with people with scores below 620, meaning, to qualify for another loan, credit rehabilitation will probably be necessary. The waiting period for an FHA loan after short sale may be greatly reduced for borrowers who can demonstrate extenuating circumstances caused the hardship. If the borrower can show that the short sale occurred from income losses outside of their control, they can be eligible for another loan in as little as 12 months. Extenuating circumstances are defined as something that caused income loss or job loss, reducing the household income by 20 percent or more over a prolonged period of at least six months. To qualify, lenders need documentation that outlines the “economic event.” Documentation can come in the form of VOE forms, termination notices, business closure notices, tax returns and W-2 forms. Additionally, the applicant must have re-established their credit for at least one full year. Satisfactory credit is defined as not containing late payments, on a mortgage or revolving credit accounts and 12 months of fully completed payments. The final component of the reduction in waiting time is educational. To be approved for another FHA loan as the beneficiary of an expedited period, the borrower must take part in housing counseling. This is designed to help borrowers fully comprehend their mortgage options, establish a housing budget, and avoid scams. Counseling must be undergone a full 30 days or more before the loan application is submitted and must be in the form of one-on-one counseling from an HUD-approved agency. Counseling can be completed in one hour and can be conducted in person, online or over the phone. If a borrower underwent a short sale on their primary residence to benefit from declining market conditions and purchase a similar or better property within commuting distance at a price reduced when compared to the up to date market value. To find out more contact Federal Home Loan Center today at 877-432-5626!